In My Kitchen Garden: Garden Journal 8/18/10: Tomato Season Has Arrived and the First Harvest is In! Guilt be gone, the header photo can stay, I'm once again a real tomato gardener who can proudly hold her head up high while floating around the blogosphere. Phew. I'm of the opinion that you should always have at least one type of cherry tomato plant growing in your garden, because in my experience they offer the best odds of bearing edible fruit. That's especially important when you're gardening in a challenging place like Missouri, where you never know how things will go—or grow—from year to year. The reason cherry tomatoes are an almost guaranteed winner is simple: they're small. They mature quickly, which means the diseases, pests, plagues, and other terrible things that always seem to happen have less time to show up and attack your plants. In general I stick to the small to medium sized tomato varieties. Those one and two pounders? Their longer growing season allows way too much wiggle room for disaster to move in, and I learned this the disappointing hard way. My one exception is Kellogg's Breakfast, an extremely large (for me, at least) sunny orange beefsteak that I did almost give up on. 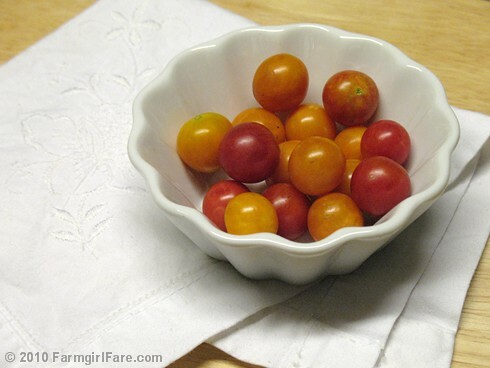 You can read all about them in my August 2006 post, Growing Kellogg's Breakfast Tomatoes and a Colors of Summer Salad with Tomatoes, Zucchini, Sweet Red Peppers, Beet Greens, Basil & Garbanzos. This variety is definitely worth the risk. Are you growing tomatoes this year? How's it going? Any new favorites? What about failures? Looking for more tomato talk? Last September I wrote about my favorite varieties of heirloom tomatoes to grow, and a couple dozen of you shared your favorites in the comments section of that post. © FarmgirlFare.com, the red, ripe and ready to grow foodie farm blog where first tomatoes or no, I am so ready for this long, hot, incredibly humid summer to be over. But the tomatoes do help a little. Do you have any recommendations for someone living in a dorm that has zero experience gardening but frequently daydreams about a life like yours? I would say to start small and dream big. Even if you're stuck in the city, there are lots of things you can do to 1) get closer to a gardening/farm life and 2) help decide if that kind of life is really want you want. Visit a farmers' market and get to know some of the growers. Most are friendly, happy to talk about what they do, and generally willing to share information. You might even get an invitation to visit their farm - though you might have to work for your tour! Which could be great. Find a farm near you that allows visitors. Even if you're in the middle of an urban area, you might be surprised to find that somebody is growing food near you. See if they allow volunteers to come and work and learn. Some may let you even just spend one afternoon every once in a while weeding (there is ALWAYS too much work that needs to be done on a farm). A great way to find farms and farmers' markets is to check LocalHarvest.org. Find a farm that offers a CSA (Community Supported Agriculture) program (again, check LocalHarvest.org). Even if you don't need all the food the subscription provides, you might be able to split one with a friend, or even just go to the farm and help out in exchange for some produce once in a while. Some CSAs are more flexible than others. Some require you to come pick your own produce, or work a certain number of hours at the farm. Some let you work for your subscription rather than pay cash for it. If you have a chunk of time where you can get away, consider a WWOOFr position. It stands for World Wide Opportunities on Organic Farms and there are all kinds of positions available in countries all around the world. I have a friend who just spent 6 months working on two different farms in Scotland (usually the stays are more like 6 weeks). You're provided housing and food in exchange for a certain # of work hours per week - usually about 25, so you have plenty of time to do other things. There are ALL kinds of farms listed. The WWOOF website is WWOOF.org. If you want to try your hand at gardening, see if there is a community garden in your area. The way they usually work is that you rent a section of the garden for your own personal use - fees, rules, sizes, etc. vary. Some have years long waiting lists. Many are newly formed. Even if you can't commit to a space of your own, you might be able to get to know a gardener or two and become friends with them - and help them with their plot. There are so many ways you can get a taste of country living without leaving home (besides visiting my blogs! : ). I hope some of these ideas help. Blight has struck here for us for the second year in a row. It is frustrating to see some of the plants dying off, but in planting 75 plants this year I know that I won't go tomatoless. So far I have harvested over a bushel and I hope that I can get at least 1 more bushel out of them. Crossing my fingers. I live in Oregon, too, but on the coast. We have had a very consistently cool summer here....no hot days like you, Denise, and this morning I am secretly wishing to turn on the furnace to take the chill off. Looks like we will have sun, soon, though. Most of our mornings have been dark until noon. So, needless to say, my tomatoes have suffered and I certainly won't be canning them this year. I have 5 pints...yes pints, of green beans and 4 bags of frozen peas and 4 pints of sandwich pickles. Thats it, so far. I have never kept up with zucchini until this year. Not even enough to make my zucchini relish, which we love. Cucumbers and winter squash have done the best for me this year. If we have a long fall, though, maybe I will get some more produce. I planted very late pole beans and they are looking great. Just starting to flower and they will go on for a long time I hope. Though my garden hasn't been the biggest producer I've ever grown, it has been one of the prettiest. It's green and lush still, with bright yellow squash flowers intermixed. My corn has red stalks and green leaves. Looks like Christmas. I grew it last year, too, and it's so pretty. I love my garden every year, so guess it doesn't matter the weather. I'll always try again. Last year in Massachusetts we had the Great Tomato Blight, and I harvested few. This year, yowza! Cherries forever, grape tomatoes, roma tomatoes (chipmunks love these) and a couple larger varieties. We had tomato bread salad (panzetta) earlier and gazpacho yesterday. Crop is good this year, but the larger tomatoes do not have gazillions of fruit. The quality is good, and I'm planning tomato soup Florentine (with spinach) this week a la Au Bon Pain. I love any recipe that says, "take 5 ripe tomatoes." Basil also plentiful, and we've gorged ourselves on Insalata Caprese. Eating (more or less) healthy never tasted better. The early warm moist spring and the hot dry summer created a good tomato environment. I had a lot more luck with my cherry tomatoes, too. I planted them in pots, which I have to water daily, but at least I get something out of it! Did have a few early tomatoes in the beginning of July before some sort of blight/mildew hit. The the plants almost died. Then it got so hot that it killed off whatever blight or mildew was destroying them, and I have a few green tomatoes atop brown stalks now. Which looks odd, but it's sort of like second harvest. Any experience with squash beetles? They destroyed my zucchini, which I thought was indestructible, and have moved onto my butternut squash. It has been cold and foggy all summer on the Central Coast of California and nothing has received much in the way of sunlight or warmth in my garden. The CSA down the road has a mile more distance between themselves and the fogline (which we are in) but they are having a slow summer too - it's the same everywhere in the county and they are worried about the grapes so I am not alone. Still, I was really hoping that by getting a later start I might seem some action by September, but I have had no fruiting to date, (not that the deer cared when they chomped off the tops of half my plants and all the arugula). Oy! The only things doing anything are the scallions were started in March. That's pretty pathetic. Sunshine please! It's been a cool summer in San Diego - coldest July in 77 years. Summer finally arrived last week. Nevertheless my tomatoes are doing fine. Favorite: Sungold. Harvested over 1000 from one plant (at about 55 sungolds to a pound that's 18 lbs of tomatoes). Black Cherry has been tasty but I planted too close to the Sungold and it's overshaddowed. Anna Russian is a pretty pink ox-heart. Very meaty with okay taste. Wisconsin 55 is pretty much what you get in a grocery store. Susan, I agree with you cherry tomatoes are they want to go. -Cherokee Purple, doing well, DH's perennial favorite. -Amazon Chocolate- prettier than the Cherokee but not as tasty. Has produced less too, but it's also younger. -Jumbo Jim Orange- good tomato taste, low production. -Rutgers- Heaviest producer in the slicer category. Typical tomato that most people would recognize. Black Cherry- Good producer but not overwhelming. Fruity tasting. I'm considering making a jam of some sort out of this one. Sun Gold Select II- The company did state that this variety isn't stable yet, but of all the packets in all the towns in all the world, these seeds walked into mine.... It's red, not gold. It still tastes pretty good but not as good as the Sun Gold Select (seeds) that I purchased in 2002. All in all it has been a pretty good year for tomatoes here in Mid-Missouri, although they had a pretty rough start of it. I think it was cutworms that took most of them out; so plans and varieties changed but it all worked out well enough. Luckily, I also planted 2 roma plants and we have already enjoyed many, many tomtatoes off of that. I have approx. 20 green heirlooms right now. 3 of them are huge. I'll keep my fingers crossed! So, yeah, we're growing tomatoes here in suddenly hot NorCal where it's been in the 70s until today (which is in the 90s), in the middle of August. The tomatoes have put out their first big harvest and are setting blooms for the second round. I was all excited to grow a black tomato this year, except the little seedling with the "Black Krim" tag turned out to be a Brandywine. Which, fine. It's beautiful, huge (nearly 2 lbs apiece) and tasty so I can't complain. It's not black - but maybe next year I'll get one with the right label. The Better Boys are doing great as always. Love those tomatoes - best all-purpose variety I've found with the best flavor. I did not, however, plant any cherry varieties this year, and that's a bummer. Thankfully, my neighbors put in a Sun Gold - which is my fave cherry type - and they let me raid their plant whenever I want. I think that I'll plant my own Sun Gold next year though because I'm greedy that way. The same thing happened to me this year, re: surprise tomatoes. I rented a community garden plot from my town and planted Rutgers, Early Girl, and Roma tomatoes. A few weeks later, there were tomato vines in another area. I moved them and tended them, and for the past month or so I've had really prolific Sun Golds and Tommy Toes as well as the others! This is odd because they plow the fields at least twice before opening them for planting. But I'm told the person who had my plot previously took great care of it. The German Johnsons I planted in my backyard tanked, though. We had a much hotter and drier summer than usual here in New Jersey, and it was harder on my yard than the community garden. I love your blog. I found it looking for pizza sauce just now, and plan to read much more of it soon. The local Foodie Folks here in Reno/Tahoe were planning a tomato tasting in September. They just canceled it because the tomato season here is so pathetic that none of the local (personal and commercial) growers felt they could supply enough tomatoes to make the tasting worthwhile. How sad is that?? I have had two ripe Juliettes so far, that's it. Sigh. I'm drowning in tomatoes--Baby Cakes, Stupice, San Marzanos, Romas, Black Krims, and Jet Stars are all plotting my demise by canning. I'll beat them in the end though. I always do. Well, me and the frost. Well I think the Tomatoes look great whenever the picture was taken. In Northern Virginia I finally harvested some Burpee Big Boys and something else (larger, lost the tag) last week. My CSA (near Washington's Birthplace, VA, more coastal/warmer) has been providing me with an abundance of Sungolds, Black Plum, and other assorted pink & red tomatoes so I've slow roasted several pans to restock my freezer spaghetti sauce stash. Basil and swiss chard have been consistently great, again squash borers got all my zucchini, but there's plenty of growing season left.